Adobe Photoshop Lightroom comes with powerful tools to sharpen images during post-processing. Located in the Develop module of Lightroom, the “Detail” box contains both Sharpening and Noise Reduction tools that allow Photographers to enhance their digital workflows by fine-tuning images and getting them ready to be published and printed in a quick and efficient way. Since I have already covered the noise reduction part in my Noise Reduction Tutorial, in this article, I will show you how to properly use the Sharpening tool instead. Over-sharpening – when too much sharpening is used, it results in harsh, visible lines on edges and around objects. Over-sharpened images often look too “textured”. Too much noise – using excessive amounts of sharpening can add a lot more noise to an image. The worst result is when an image is already shot at high ISO levels and sharpening is applied on top of the digital grain, resulting in even more noise. Zigzag lines – straight thin lines can get converted over to zigzags and circular shapes can get cubic transitions when excessive sharpening with a large radius is applied. Note the amount of noise, visible lines, zigzag lines on the grass and too much texture – all because of over-sharpening an image. Lightroom comes with a very powerful sharpening tool within the Develop module, under the “Detail” panel. It is very similar to Photoshop’s “Unsharp Mask” tool, but better, because it gives you extra controls over how you can sharpen your images. Before Lightroom, I used to sharpen every single image through Photoshop, which was painful, time-consuming and destructive (meaning once you make changes to an image in Photoshop, you cannot undo them). Unlike Photoshop, Lightroom does not modify images – it stores changes either in a separate file, or in image headers, depending on the image format. If I make a mistake or want to go back to the original image, I can simply reset the image to its original state or revert modifications through the history panel. Being able to specify custom settings on images during the import process is also another time saver, especially when working with thousands of photographs. Press “D” on your keyboard or click on “Develop” on the top right panel to get into the Develop module. Left-click your image to view it at 100%. I highly recommend to view your images at full size (100%) before making any sharpening changes. Expand the right panel in Lightroom and scroll down until you get to “Detail”. Amount – the amount of sharpening you want to apply to an image. Zero means no sharpening is applied to the image. The higher the number, the more sharpening you will see. Too much sharpening will also increases the noise. I typically set 50 as the default value to my images, but sometimes can increase or decrease the amount depending on the image and noise levels. Radius – the size of the sharpening area around the edges. The default value of 1.0 means that Lightroom will apply sharpening over 1 pixel around the edge. If you increase the radius to a maximum value of 3.0, sharpening will be spread over three pixels around the edge, resulting in thicker, “shadowy” edges. I use the default radius value of 1.0 most of the time and I recommend to keep it under 1.5. 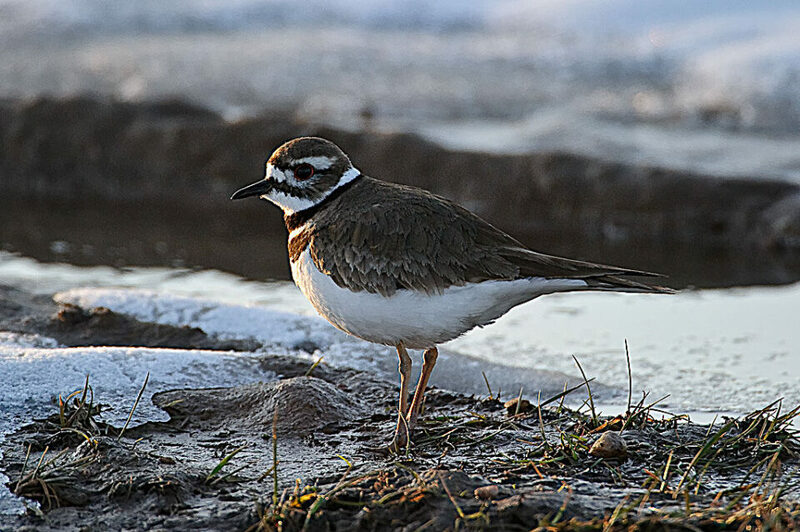 Detail – as the name suggests, the detail slider controls the amount of sharpening on the edges or “details” of the image. A small value like 0 only sharpens large edges, while a high value like 100 would sharpen even the smallest edges. For example, if you are working on an image of a bird, if you leave the detail at “0”, only the edges of thick feathers would get sharpened, while using a larger number above 50 would bring out and sharpen even the thinner feathers. I try to stay below 50 on the detail slider, because higher numbers often considerably increase the amount of noise. Masking – the most useful and versatile feature that masks out areas that should not be sharpened, similar to the mask tool in Photoshop. This is the tool that would take care of the extra noise produced by “Amount” and “Detail” sliders around your subjects. While it is not very useful for images that have too much detail and too many edges all over the image, it works magic for images that isolate subjects from the background. The softer and less defined the background, the better the results. See examples below. Combining the above controls, you could effectively sharpen your images without much work and dramatically cut your workflow time. Let’s now play with a real image to see how we can sharpen it in Lightroom. That’s how the image looks like when I press the Alt button and move the “Radius” slider. It gives me a clear indication of how exactly radius will affect my image. As you can see, at the maximum setting of “3.0”, the radius around the edges is too thick, giving an unnatural look to the image and dark shadows around the subject. Pressing the Control/Alt key while moving the sliders for Amount and Detail will also show the effects on a gray background, giving us a pretty good idea on how the setting will affect the image. As I moved to the right, I was able to get rid of the static/grain in the sky and only leave the bird in the frame. 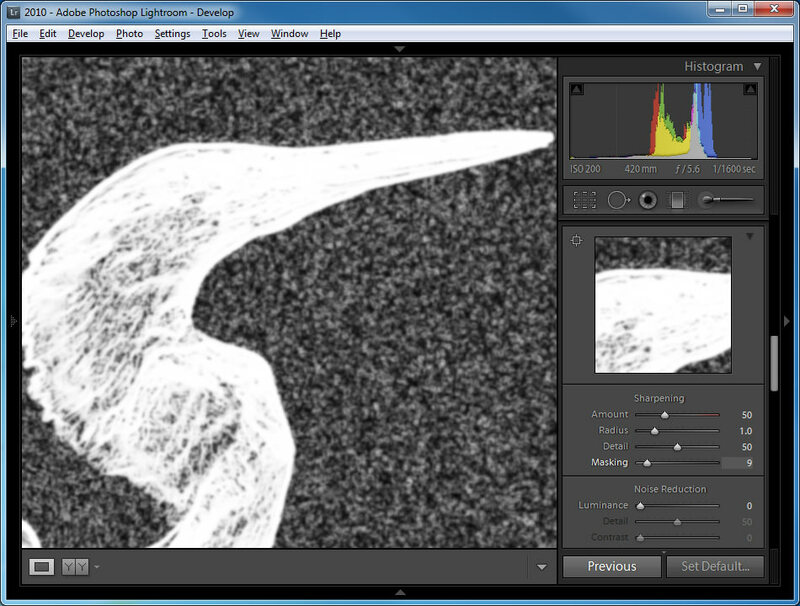 What this does, is it makes Lightroom apply sharpening only on the bird, leaving the surrounding areas intact. This is a great way to selectively sharpen subjects, without affecting the entire image. Inside Lightroom, press the “D” button to go to the Develop module. Once you are in the Develop module, open the right sidebar and scroll down to “Detail”. Hold the Option/Alt key and move the Amount slider to around 75. Note how the background gets a little noise when the value goes above 50. Try moving all the way to 100 to see plenty of noise in the background. Go back to 75 and release the Option/Alt key when done. Hold the Option/Alt key and move the Radius slider from 1.0 to 3.0. Note how thick the edges around the bird get. Release the Option/Alt key and see how badly the edges look in color. Now put the Radius back to 1.0 by moving the slider or typing “1” on the right hand side. Hold the Option/Alt key and move the Detail slider to 75. Note the whiter edges and added noise to the background. Finally, hold the Option/Alt key and move the Masking slider from 0 to 50. 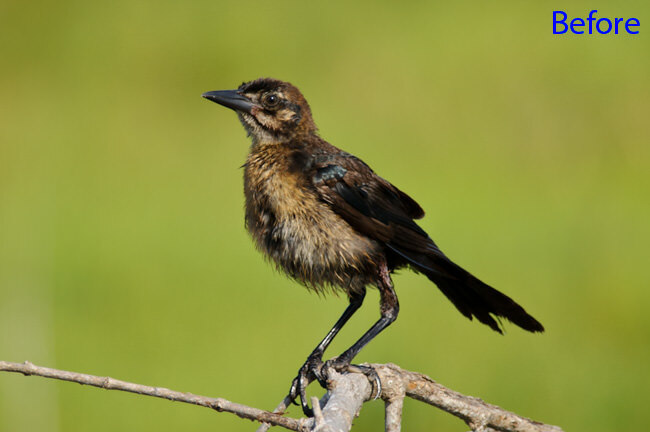 Note that only the bird and the tree are visible – the background should be completely black. Look at the final result and press the “” button on your keyboard several times to see how the image looked before and after you applied sharpening to it. You can also see the Before and After images in two separate windows by pressing the “Y” button, or you can use the switch on the “Detail” panel to turn Sharpening on or off. Here is a before and after example – move your mouse over to see the difference. The above values are for this example only – I normally do not use values above 50 for Amount and Detail sliders. 6) What about Output Sharpening? Many Lightroom users get confused about the Output Sharpening feature in the Export window. Should it be used after sharpening is already applied to an image? If you are exporting the image in its original size, then I recommend turning off Output Sharpening during the export process. If you are resizing the image to a smaller version for the web, then I recommend leaving it checked with the Screen/Standard amount of sharpening applied. When images are reduced in size via Lightroom, the sharpness is also slightly reduced, so sharpening the images a little bit does not hurt. Output Sharpening does not use the same settings you used for the image in the Develop Module though – it just slightly sharpens the entire image. Also, check out our article on three-step sharpening. Please let me know if you have any questions in the comments section below. I think, you fully covered the topic with this great article. Excellent explanation! Thanks you very much. Enche, you are most welcome and thank you for stopping by our blog! Very good description, I like Lr more than Ps for its simplicity yet powerful enough…especially when I need to process hundreds of images. Wid, you are most welcome! Nasim, I am a brand new LR CC user and thrilled to find your website. I have one question. When I press the ALT key, with my image open in the Develop screen, nothing happens. The image does not convert into a black & white display screen view like the one in your article. I’d really love to work within this mode. Can you assist? Perhaps it’s something I should set within Preferences? Please ignore my earlier comment! I figured it out. Thank you! Excited to read more of your articles. Thank you for such a detailed article! I’m experimenting with the Lr sharpening tool as right now and I’m getting some pleasing results. This is very helpful! You are most welcome Kaspar! Let me know if you have any questions. You are most welcome Tao, thanks for visiting! Wow! Finally, someone explains it all to me in a very clear and concise manner. I am so thankful for this. I was one of those people getting confused by the various sharpen features and had no clue about the ALT function on my Mac. I recently had a shoot with a friend of mine and had some shots that I wanted to clean up and save but had no idea how to go about doing it with the very limited knowledge I had about Light Room 2. I will employ your suggestions as soon as possible now that I am psyched about my prospects! Thanks so much, Nasim! Sean, I’m glad that you found the article useful. Thank you for your feedback! Thanks a lot for this useful tutorial! You are most welcome Eric! fantastic….never knew importance of sharpening till i read n did this in practical…. Subodh, thank you for your kind words. Good luck! Thanks so much for this article…I am fairly new to LR3 and this has saved me a ton of time. You are most welcome Pak! Thanks for your various helpful Lightroom posts. One quick question — the output sharpening in Lightroom is in addition to whatever sharpening was applied in the develop module, right? Bill, the output sharpening is in the export dialog box. This was an excellent tutorial. Without use of the command and option key, its like stumbling around in the dark. Thank you very much. I now see where I went wrong and how to do it better. My question is, what are the settings for output sharpening? I can’t see their actual values anywhere. I have been turning off the output sharpening since I don’t know what it is adding to the image. A client of mine submitted one of my images to a national magazine for an ad, and it looked hideously over sharpened, yet it looked fine on my monitor. I hate cringing when I see it in print. Marsha, leave output sharpening on when you downsize images. So, if you have a sharpened image at full resolution and you are converting it to 1024×1024 for web, the image will look a little soft when you downsize it. Leaving output sharpening on will sharpen it further more after the reduction process runs. Nasim- I just sharpen on export, depending where it is going..web or printed in a magazine. To understand, I should sharpen in Develop mode and not sharpen on export unless I am downsizing? Great tutorial! One question: are these slider number recommendations/guidelines for RAW files? I sometimes shoot JPEGs and I am seeking guidance for a starting point on the detail slider numbers. Thanks! I really learned a lot from this article. Being a fan of Lightroom for a couple of years and not knowing these simple tricks! Unbelievable! I am very happy with your advice as now I see the sharpening process as something logical and tangible. Thank you for your explanations on sharpening. I learned a lot and have known features I did not know before. I am a bird photographer in the Philippines. Is it proper to do all the sharpening and denoising in LR using the raw files, rather than in PS after exporting the raw into tif file? Or is it better to do some sharpening and denoising in LR, and then make the final ones in PS after cropping the tif picture into the desired composition? Essentially, my question is – is it better to sharpen and denoise the picture in full resolution using the raw file, or after cropping the tif file into the desired composition that we then apply the sharpening and denoising? I’m a bit confuse in this regard. I personally do all the work in Lightroom first and then take it to Photoshop for additional changes, if necessary. If you use Photoshop plugins like Nik Software Dfine or Viveza, I would pre-process and crop in Lightroom, and then remove noise/sharpen in Photoshop. Once saved, it will become a large TIFF file. If you are not using any Photoshop plugins, then do everything in Lightroom. 1) why do you prefer ‘use Photoshop plugins, like Nik Software Dfine or Viveza, in Photoshop’ , once you can do it directly from Lightroom ? 2) defaults values sharpening in Lightroom: are they applied to ALL IMPORTED PHOTOS ? how can we disable that in Lightroom? 3) default sharpening in-camera is applied also to raw files? This is an excellent article – thank you! I have one question: is it better to sharpen before cropping or after cropping? Rukkas, I personally do it after cropping, although some amount of cropping is already applied to my images in Lightroom. Thank you for the time to write, detail and explain a great tutorial. I have been looking all over the web for this!!! Thank you for explaining it SO well!!! Awesome tutorial.. Could u apply settings like this on import to all photos as a base, and then adjust from there? Do you find 50 is the minimum amount for most photos? This really is a great site, loaded with tips for “beginners”. I still learn a lot! Thanks. Best explanation I’ve seen yet. Thank you! Love your photographic inputs, very helpful! What is the best measure for this sharpening technique if using Photoshop CS5? Thanks! Is LR3 an appropriate solution for “final” sharpening? Or should I sharpen, export, the re-sharpen in PS or some other external editor? Thanks. Eric, it depends on what you are trying to do. For web use, I believe it is. I typically sharpen it at around 50/25/50 in Lightroom and apply more sharpening when resizing for web. However, if I need to sharpen specific areas of an image without touching the sky or other areas, then I use Photoshop plugins from Nik Software to do that. i’m buying a nikon d3100 for Christmas and i’m using your blog as reference. it’s so newb-friendly and it doesn’t kill amateurs with all those complexities! keep up the good work sir! I’m a beginner in photograpy and I apologize if my question might be a no brainer. I’ve noticed some of the photos posted on pixel-peeper are so clear and crisp. Do you know whether or not they use RAW images or JPEG and do they use Lightroom to sharpen images or they just have excellent cameras? I have similar lens to what they use but some of the images are way too sharp and crisp to mine. I hope I’m not being too wordy here. I would appreciate any response. Thanks! Before I used picasa to edit my photos. Recently I starting shooting in RAW and moved on to LightRoom. In LR all these time I was using the sharpening tool without even having any idea how it actually work. I watched few youtube videos on LR sharpening but they were not that much of a help for me. Your article is complete. You explained everything so nicely. Now I know exactly how these 4 sliders work. Thank you so much for taking your time to write this. Thanks for the excellent post! I just discovered your website and I have to say it’s really interesting and professional!! What do you think about this, is it correct or could be improved? Best article about that i had read. Thank you so much. Excellent site long time reader first time poster. I have a Nikon D7000 and wanted to know your thoughts regarding capture nx2 vs lightroom. I am an amateur shooter and workflow is not really a problem,i post process very few pictures. I workflow is not an issue do you think capture nx2 is better than lightroom.Some ppl say it can access nikon raw data better than lightroom. Really excellent and in-depth post about Lightroom sharpening, thanks a lot! I have been using export sharpening more; will start to get to grips with the process you suggest here. Cheers! Thanks for the great article, Nasim! 1. what values are optimal (D7000) and whether to use it at all considering that sharpening can be done in post-production? 2. If in-camera sharpening is used, does the original image get modified irreversibly (RAW), or sharpening is just saved as a part of metadata? If it’s a part of metadata, do you have any info on whether software like PS/LP can properly recognize it? Iam new to the DSLR world. Recently owned canon 550d. Still exploring, really enjoying it. this website has given me lot of inputs. very very clear & informative. thanks a lot. i sometimes use the sharpening in my Nikon ViewNX 2 software. i find this software very intuitive and therefore easy to use. how has been your experience of this. one major defect, however, is that View NX 2 drastically reduces the size of the images after any editing, incl. say sharpening or brightness. some nikonian forums reccomended buying and using the Capture NX 2 software instead. what are your views on the same as non-pro like me would like an intuitive software as opposed to something as forbidding as Photoshop. Btw – what in your view is the best book for learning photoshop for beginners? Hi Nasim, im fairly new to Dslr , when I purchased my first one three months ago I’ve never taught id be improving so fast in learning all the techniques thanks in part to your website wich has always been a great support for my learning curve.However I’ve never taught editing pictures would be such a huge part of the job, but when I saw what could be achieved I wasted no time in shooting raw and trying to attain the best possible in photography. Anyways I hope you will be able to answer this question . I’m very divided between Capture NX and Lightroom . I’m using both right now because sometimes I find its very hard to attain particular goals in lightroom and the same could be said about Capture NX. And also the colors and sharpness of the unedited raw with the nikon editing software is much better at the start. IHowever even with this tutorial and trying every wich way possible I find that with the picture control utility (and some of the capture nx settings) I’m most of the time able to reach a certain sharpness in some pictures that I just can’t with lightroom. Dont get me wrong sometimes my sharpness is just has good with LR but lots of times some picture I dont know why I cant get the sharpness I get with capture nx or even View nx its like theres is a small blur that I just cant get rid of in lightroom ? Thank you! I also didn’t know about command option in lightroom! Now, I’m getting better results when sharpening. Thank you, this was very helpful. I was using sharpening just on export and found some images to be very noisy. I’m also finding they seem darker after export, do you know what this is due to? You dont know how helpful is your tutorial for me !!!! Thank you very much! That was a great help. Great explanation! What, if anything, would you change to update the specifics you discussed for LR4? Great article. I am always afraid of oversharpening and seem so have trouble with choosing the “correct” amount and detail even with the ALT grayscale screens. Any tips on how you decide. Great article, as a LR newbie I am happy to read from the experts. Now one question I have, is there any way to export that sharpen mask into Photoshop along with the image for later final sharpening of the PS edit? Would save a bunch of time over the whole !glowing edges! method!! Again a brilliant tutorial! I have been using lightroom since a year and did sharpening just by hit-and-trial. No other blog explained amout,radius and masking so precisely like you did. Again a brilliant tutorial! I have been using lightroom since a year and did sharpening just by hit-and-trial. No other blog explained amount,radius and masking so precisely like you did. Thanks for this write up. Was editing an awkward photo last week and applied your masking tips to it. made it perfect. Big thanks. I’m trying to use the alt/option button but it doesnt always work. Is there a setting or something I need to change? Great articles as always! Very succinct & clear explanation. Is there a guide for using Spot Removal & Brush adjustment tools? Thank you so much for this amazing article. With this and your noise reduction article i have just redone a number of photo’s for a friend and the results are incredible. Thanks for taking the time to provide such a concise and easy to follow explanation. I particularly like your little touches such as the before and after noise reduction just by placing the mouse over the pic. Great job. Great article. I am still a little confused. If I do sharpening in the sharpening panel, do I still do some sharpening in the printing module before printing? Also, if I have a photo in Lightroom, make some adjustments there, and then send it to Photoshop and do sharpening via unsharp mask in photoshop and then take the photo back to Lightroom for printing, do I use the sharpening section of the print module to do more sharpening? Wow. Didn’t know alot of this stuff. Thanks for teaching it!! I found this page after discovering that images exported in LR were losing sharpness. Why is that? If I resize an image in Photoshop it doesn’t lose sharpness? It seems nuts to resharpen an already sharpened image … I would think artifacts and other degradation would be show up at that point. Josh, when exporting at the same size, you should not sharpen images during the export phase. Sharpening should only be applied when exporting at a smaller resolution, as indicated in the article. I stumbled on your very useful tutorial following a link from DPReview. One minor editorial comment, though. In your text you say Command/Alt in a number of places where I think you meant Option/Alt. Thank you for your contribution to the community. Thanks for your really useful article. Just wondering does the same ‘output’ sharpening rule (use if downsizing image for screen) apply to output sharpening for print?? Hi Nasim! Thank you for tutorial, it works and helped me! Thanks so much for the detailed yet succinct explanation. Very very helpful to me Nasim. Hi Nasim! Your website is so wonderful and helpful!! Looking for a little advice – as I have been using your write up on sharpening and noise reduction for lightroom – I recently ordered an enlargement of an image, and both myself and my customer were disappointed in the amount of grain on the image when it came back. (20×30). Due to the price of the enlargement – I want to be certain that I have done everything I can (post production) to ensure the next one comes back looking clean and sharp. You recommend making the changes with the image at 100% or 1:1. If my standard image size is 3456×5184 – what magnification should I review that is closest to what I would see when enlarging to a 20×30” photograph. (does that even make sense?)) Thank you!!! Thanks Nasim! By the Web’s standards this is an oldie but a goodie post! I’ve been looking for good advice on how to work this problem and this article offers some great insight. Thanks! Great post! Sorry to be dense, but I can’t see how to download the full-size image of the bird you used as an example. Right clicking the image only gets a 155Kb version! And about “perceived sharpness” vs “real sharpness”, it depends on a lot of factors. Especially viewing final size. When you reduce a Nikon D800 image down to web size WITHOUT sharpening…you get a dull image. Sharpening is mandatory for any size reduction and any output (screen/print). The only thing you gain with sharper lens and bigger sensor is final viewing size. As most ppl don’t even print in big size…there are enough MP even on any recent camera. I think, it’s the best tutorial/explanation I have ever read about sharpening. I have finally known and understood what all the names mean! Thank you Nasim, this is excellent information. More so because it is not really available from the manual. You must be either one of the developers of LR or a genius hacker. I echo the comments above – great article thanks! I have thought that masking works exactly as you describe – that areas that are black while pressing the alt/option key are not affected. Therefore, I often use a very “strong” mask to only sharpen the edges of a subject/scene. However, I have recently realized that in some images I am loosing detail in areas that should be hardly/not affected by sharpening. Although you mention that masking is not effective in images with a lot of detail, I was surprised that I actually loose a lot of detail. I am much more careful with the masking tool now! Thank you for an interesting article. I see that this is an old post, but I can try and perhaps get an answer. Why does LR soften all images after you have exported them? I use LR 4, but this has been a problem for me since the first LR version. I don´t see an option for posting pictures here or else I would have, so you can clearly see on the screenshot an exported version and the one in the LR next to each other. This is also very easy to check. Excellent! Just what I was after! thank you! This was so so helpful, easily understood and explained in simple terms. Just what I was looking for, thanks so much! Thank you for this article; I am currently using LR5 and having so many problems sharpening my images. I don’t have a good camera, I am using images taken with my LG-G2 phone. The problem I’m having is images look great in LR but once I Export and upload to my blog, they look terrible. Any additional tips you can give for sharpening phone pics? LR does not recognize my ‘camera’/phone so that could be part of the problem. Thank you so much you have definitely showed me in this article everything that I was missing or unaware of how to use. Outstanding explanation and examples, thanks! Thanks Nasim, Very clearly explained. I didn’t know alt key feature. 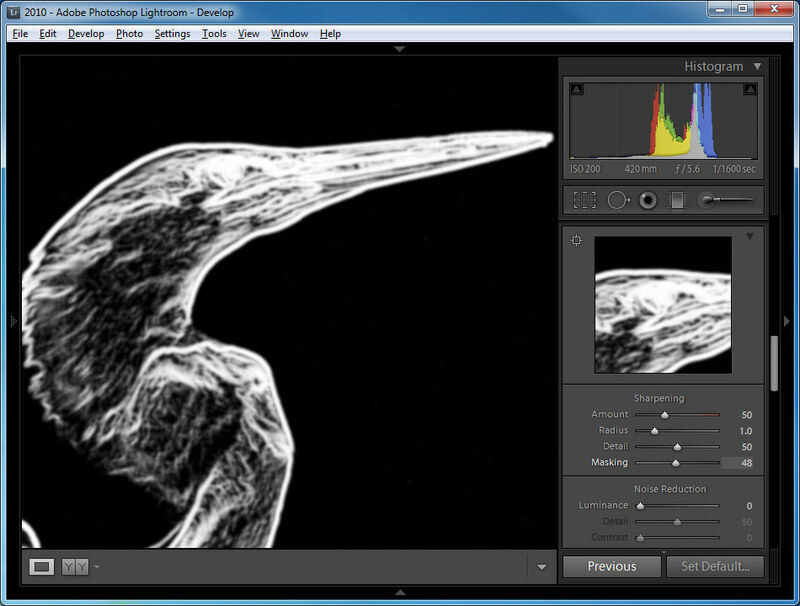 When do you suggest sharpening be done during raw processing, towards beginning or end ? is it beneficial to sharpen in raw or jpg ? I was exactly looking for it..
My images are pretty good in RAW but when I try to enhance it in LR5 the output will be pathetic in terms of sharpness, that too when i publish in any social media which reduces the sharpness further makes it messy. I was using the LR Detail section without full understanding now with the “Alt” key i can control and preview my changes. Great article, big eye opener. If i get time I will go ahead and re-process my old files. Hi! Just read your article, which was very helpful for a totally noob at Lightroom as me. But I have a question for you. I took a picture of a couple, but when I transferred it to my pc, I sadly realized that I my focus was on the background, not in the foreground where the motive (the couple) stood. So my question is; Is it possibly to use either Lightroom or Photoshop to get a clear image of the couple? depending on how much the couple is out of focus, you can possibly sharpen it to get a “nearly useful” picture, but it will never ever be the same as if you had put the focus on the couple from the start. I’ve already soaked up quite a percentage of Photography Life’s knowledge, but this article was just dead on!! THANK YOU SOOOO MUCH!!! What also helped me in understanding the whole sharpening process is reading about the “Unsharp masking” method used in film development — thanks to Wikipedia. Excellent article. Any updates to “How to Properly Sharpen Images in Lightroom” due to newer versions of Lightroom? Thanks! Lately when I want a solid answer that I can easily understand I make use of the “site:” google search parameter in order to cut down on the “noise” I get on searches and get right to YOUR answers that if available I KNOW will answer my question… Thought your other readers might also benefit from the technique so here is an example for those not already familiar with the technique. By using that parameter I get ONLY your quality articles related to this particular search. Still a great and extremely useful article after 6 years! Thanks bunches for putting this up. Appreciate your work! This is a very good and useful sharpening article. Thank you to share your knowledge and experience with us. I have two questions (1) Photoshop camera raw has a very similar sharpening tool, what is the difference between them? 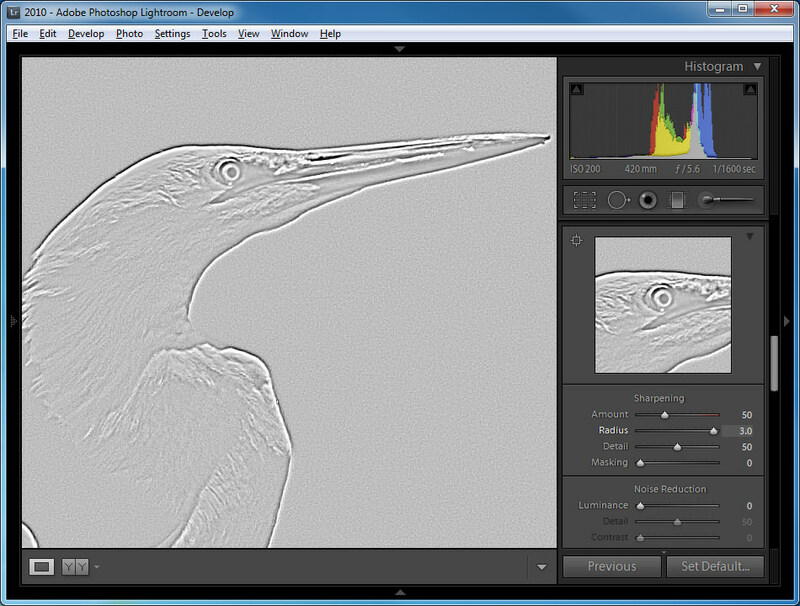 (2) Nik sharpening pro has some unique features, do you have some experience about it to share with us? Simple and amazing tutorial, thank you for the time. thanks a million for this complete and generous education. Thank you very much for this very simple yet effective way of explaining sharpening techniques in LR. 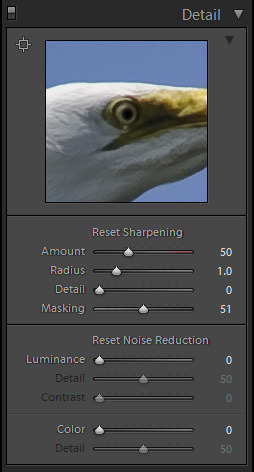 Wow, I’ve had Lightroom forever and never fully understood how to control the sharpening until now! Thank you so much! Amazing explanations !!! Thank you! Very helpful, especially the radius and detail section. Thank you. You’ve just saved me from the wrath of my highest paying customer. I also say thank you for such a simple, understandable and lucid explanation of this process. After reading a number of other not so easily undertood explanations, yours hit the target. this is a great idea about photo editing process using lightroom. I have more benefited from your awesome article. thanks a lot but I need the best idea about using this lightroom? your tutorial has made a great difference. The best things in life are free, such as this tutorial. Thanks! Is there a reason I cannot see the photos in the article? Jessica, probably something on your end – it works just fine here! Merci Nasim it’s very instructive to read you. I make me a better photographer every day. Awesome! This is an excellent explanation and step by step tutorial. I have been struggling with sharpening for quite some time. You explained it in a way I could understand, without getting overly technical. I especially liked your tutorial images. So many articles don’t give any actual visuals. Thanks so much. Now it is time to play…. Great Tutorial! My question is… Whatever sharpening method we have in Lr, is it same as the Unsharp Masking or High-pass filter? Or is it totallly different from Both these filters? Thank You Sir for explaining to us hot to properly adjust the sharpening tool in LR. Greatly appreciated. This may seem like a silly question, but do the pictures have to be taken in RAW to use these features, or can one edit a JPEG file as well. Awesome info thank you very much! Is there a way I can select and sharpen all the images in the import at once? Greetings and thanks for the clarity of your explanations. I had gone through the lynda.com tutorial on this topic a couple of times but was still a little unsure about radius and such matters; your tutorial added further detail and explanation so now i have a more complete picture of these ideas and practices. Super helpful, practical, and effective – many thanks for your superb tutorial! I was able to apply what I learned from you immediately, with great results. Awesome! This is an excellent explanation and step by step tutorial. I have been struggling with sharpening for quite some time. You explained it in a way I could understand, without getting overly technical. I especially liked your tutorial images. So many articles don’t give any actual visuals. Thanks so much. Now it is time to play…. Super helpful, practical, and effective – many thanks for your superb tutorial! I was able to apply what I learned from you immediately, with great results.